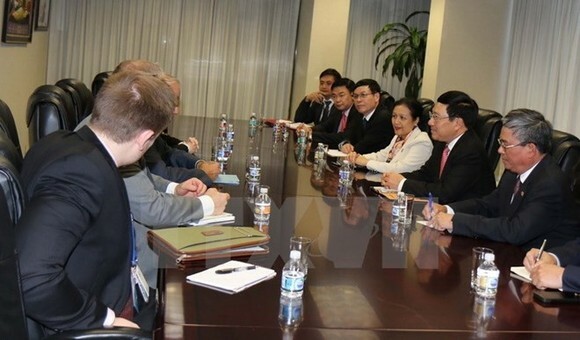 Officials of many countries and international organisations have affirmed they consider Vietnam an important partner in Southeast Asia and Asia-the Pacific during bilateral meetings with Vietnam’s Deputy Prime Minister and Foreign Minister Pham Binh Minh in New York on September 22. On the sidelines of the ongoing 72nd session of the UN General Assembly in the US, Deputy PM Pham Binh Minh received US Under Secretary for Political Affairs at the US Department of State Thomas Shannon, during which the two sides exchanged measures to realise the outcomes of Prime Minister Nguyen Xuan Phuc’s visit to the US. Minh hailed the US’s decision to open its market for Vietnamese star apples, stressing that the two nations needs to step up collaboration in the fields of mutual interests at bilateral, regional, and global levels, for the sake of their peoples as well as for peace, stability and development in the region and around the world. Shannon suggested the two sides build on the positive developments in the Vietnam-US relations in recent years to promote dialogue and mutual visits, especially the upcoming visit to Vietnam by President Donald Trump in November 2017, and to enhance result-oriented cooperation in trade, investment, science-technology, security-defence, humanitarian activities, as well as in regional and global matters. Deputy PM Minh also had meetings with the Prime Minister of Macedonia, the Deputy Prime Minister and Foreign Minister of Bulgaria, foreign ministers of Albania, Saudi Arabia, Hungary, and Morocco, the Executive Chairman of the World Economic Forum and the Secretary General of the Permanent Court of Arbitration. Minh called on the countries to increase the exchange of high-level delegation visits with Vietnam and beef up bilateral cooperation in economics, trade, investment, culture, science-technology, and education, in addition to providing mutual support at multilateral forums. He stressed that Vietnam is willing to serve as a bridge to link the countries and partners in Southeast Asia. Also on September 22, Deputy PM Minh co-chaired a meeting between foreign ministers of the Association of Southeast Asian Nations (ASEAN) and the Pacific Alliance (PA). Speaking on behalf of ASEAN foreign ministers, Minh said the geographical distance could not stop the cooperative relations and friendship between the two organisations. He highlighted the available strengths of the two regions and suggested they focus cooperation on economics, trade, investment, education, people-to-people exchanges, science-technology, and sustainable development. Colombia’s Minister of Foreign Affairs María Ángela Holguín, who co-chaired the meeting with Minh, said ASEAN and PA share a lot of similarities in their approaches to regional and international situation, especially in promoting economic integration, free trade and equality as well as boosting the development of businesses, particularly small-and medium-sized enterprises (SMEs). At the end of the meeting, the foreign ministers adopted the ASEAN-PA Work Plan for 2017-2018. The Vietnamese delegation also attended other sidelines events of the 72nd session of the UN General Assembly such as the informal foreign ministerial-level meeting of the Conference on Interaction and Confidence-Building Measures in Asia (CICA), a ministerial meeting of the Non-Alignment Movement, and a ministerial meeting of G77 Group, among others. Vietnam also joined the launching ceremony of the initiative “Partnering for Green Growth” (P4G) inspired by Denmark to promote multinational cooperation in energy and water, ecosystem, land, food, and sustainable urban development. Vietnam is a partner in the initiative.